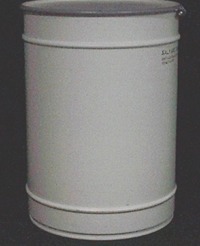 Steel 110 Gallon Salvage, Plain Cover, UN 1A2/X445/S, Available In White And Green. Interior Dimensions: 30″ I.D. X 41″ I.H. 110 Gallon, Open Head Steel Salvage Drum – This is the largest Salvage Drum we provide. The 110 Open Head Steel Drum is ideal for the biggest, toughest jobs where only a machine and hard steel will do. Made with Carbon Steel and formed to the standards of UN 1A2/X445/S, this drum is for those who take fewer trips and have larger loads than your average salvage company. Categories: Steel Salvage Drums, Open Head Steel Drums. 30″ I.D. X 41″ I.H.